Delicious, nutritious, easy to prepare – salmon is a fantastic raw material from which you can conjure up a quick dinner or a wonderful lunch. During this treatment salmon gets crispy and retains its juicy meat. Use heavier quality pan, ideally with a non-stick surface. Heat the butter or oil over medium-high heat and place portions of salmon on the bottom with the skin side down, fry for 4-5 minutes. Turn the fillet over and fry for 3-4 minutes, so that the meat remains pink in the middle. Poaching is a very gentle cooking method, in which the fish will preserve its healthy benefits and original flavor. You can poach salmon in the water, fish broth, chicken broth or milk. You can add other flavors – bay leaf, pepper or lemon. In a higher pan, heat the fluid to a temperature of 190 degrees, which means that it must be kept below the boiling point. It should not be boiling, just finely bubbling. Carefully place the fish inside and cook uncovered for about 10 minutes. For this you need to have a charcoal or wood grill with lid. For a distinctive taste, prepare pre-soaked chips of fragrant wood, ideally maple, walnut or alder. Place chips in half the cooking grate and once they start smoking, move them to the edge of the grill to continue to smoke, but not burn. 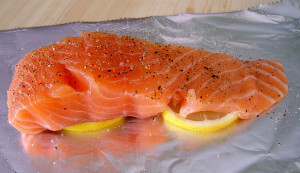 Place salmon on a serving aluminum foil and place it on the grill, close the lid and don’t open it for about 10 minutes. After uncovering check the salmon and grill a bit more if needed. Try baking the salmon in papillote. Wrap the serving of salmon in baking paper, along with oil, spices, herbs, add a little liquid – white wine or lemon juice – and bake in the oven for 8-10 minutes or until cooked. When cooking salmon on a serving pan in the oven, season the fish and brush with oil first. Meanwhile, in a heated oven heat up the baking dish, and then place the salmon inside with the skin side down, so that the fish has a crispy crust.